The Decentralization Grant Coordinator for Clinton, Essex, Franklin, and Hamilton counties is Chelsea Provost. The New York State Council on the Arts (NYSCA) State and Local Partnership Division administers an annual re-grant program that helps to ensure access to arts and culture in each of the 62 counties of New York State. The Decentralization Program is administered by the Adirondack Lakes Center for the Arts in Clinton, Essex, Franklin, and Hamilton counties. These funds are made possible with the support of Governor Andrew M. Cuomo and the New York State Legislature. ADK Quad-County Cultural Arts Grants are available for non-profit and cultural organizations in the four counties of Clinton, Essex, Franklin, and Hamilton as well as to individual teaching artists partnering with public schools or cultural learning centers in the four counties for the purpose of arts education. 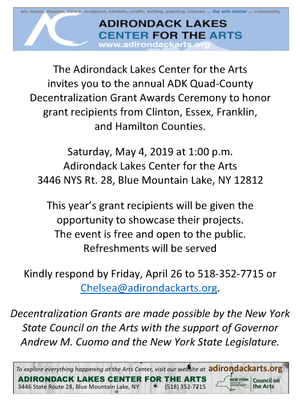 The Adk Quad-County Cultural Arts Grants process begins by attending one of the many grant-writing seminars that are scheduled throughout the four counties. At these seminars, we will explain the program, answer questions, and provide application assistance. In order to receive grant funding, potential applicants are required to attend one of these seminars before completing the application. The seminars are free and open to the public. All applicants must attend a seminar or arrange for a consultation with the Grant Coordinator–no exceptions—in order to apply for funding. The 2019 DEC Awards Ceremony is scheduled for Saturday, May 4 at 1 p.m. at the Adirondack Lakes Center for the Arts. The event is free and open to the public. RSVP to chelsea@adirondackarts.org. The 2019 Decentralization Grant submission deadline has CLOSED. All 2019 DEC applications must have been submitted by Monday, October 22, 2018. The 2020 deadline and guidelines will be updated in May 2019. For all questions regarding Decentralization Grant opportunities, or to set up a consultation, please contact Chelsea Provost at 518-352-7715. CLICK HERE for a PDF version of the 2019 DEC brochure.